This is a masterpiece. 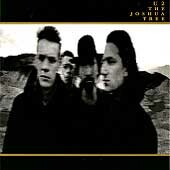 I get the same feelings from The Joshua Tree that I get from The Unforgettable Fire, but they are even stronger. I spent alot of nights lying awake in bed at night listening to this album on headphones when I was a teenager. Visions of who I wanted to be flooded my thoughts and kept me awake. The Joshua Tree kept me company. Now, in my 30's, this album can take me back to that place in my heart and mind where I can look at myself in the mirror with honesty about who I am - who I wanted to be - and ultimately who I will become. The Mrs. Reagan wholeheartedly agrees with the adjustments made.